The kiwi fruit or “Chinese gooseberry” has come from humble beginnings since it started to spread globally in the 20th century. It’s now considered to be one of the more potent super foods in the market along with other natural foods like blueberry’s, pomegranate, acacia, and manuka honey to name but a few. It only started to really find it’s feet when it began to be mass produced in orchards across New Zealand. The original version which found notoriety with it’s prickly, furry skin and beautifully green centre has now evolved into other varieties to satisfy the changing desires of the consumer. One particular variety which has exploded over the past few years has been the Golden Kiwifruit which packs the same nutritional punch but has no fuzz and yellow-ish coloured flesh. The average 100mg of kiwi fruit only has a calorie count of just 61, which is 3% of your recommended dietary allowance. But packs a tonne of essential vitamins like vitamin C which is around 154% of your RDA and far out weighs most other fruit in this category. This means if you increase your intake of kiwifruit and therefore Vitamin C, the benefits will come in the shape of a more robust immune system to help you fight off colds and coughs. Take a look at our nutritional chart below and you will see that kiwi fruit has 312 mg of potassium per 100 g serving (that’s more than fruits like: peaches, apples, watermelon, oranges) which takes it into the same ball park as banana’s. But what does this mean for your health? Well getting you fair share of potassium means that it greatly reduces the effects of sodium (salt) in your diet, which in turn helps to mitigate the on set of high blood pressure. If you are in a stressful job then definitely match this super fruit with some moderate exercise and a balanced diet. Then you will not only be reducing your blood pressure greatly but also beating some of the rigors associated with stress. Digestive health is immensely important when it comes to over all body health and can be one of the major things overlooked when trying to improve your health. Lucky for you the humble kiwi can also help with improving your intact of the necessary dietary fiber to keep things, well, regular. Now this post would not be complete without us including one of our favourite yet simple kiwi fruit smoothie recipes. This little breakfast or lunch recipe will have you bouncing around in more than any caffeine hit could and it’s also seriously yummy (an no, it does not include milk or yogurt). It doesn’t really tale a rocket scientist to figure out what needs to happen. Simply get all you ingredients together, (remembering to wash the kale and peel the kiwi fruit) and blend all the ingredients until you are happy with the consistency. If it’s a really hot day then by all means drop in some ice to ensure optimal temperature -Enjoy! 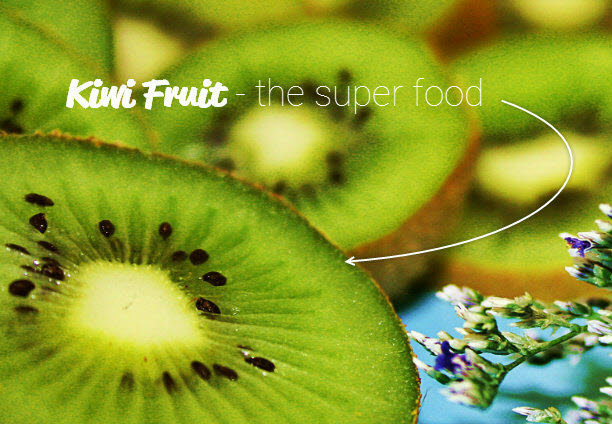 Below are all the nutritional information you require about the kiwi fruit.